We manufacture export only quality Indonesia teak furniture. Teak root wood garden furniture set. Teak wood furniture for outdoor garden made of root wood. Furniture set with teak root wood chairs, teak root wood bench and tables. Browse our Indonesia teak furniture product list. Garden furniture made of teak wood. We have a large collection of outdoor furniture and patio furniture made of teak wood. The teak wood taken from teak tree root. The hardest part of the teak tree. Our teak garden furniture surely will last for long time. Very little maintenance is needed. Indonesia Teak Furniture. 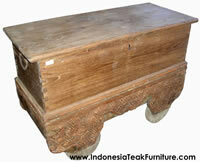 Antique Wood Furniture from Indonesia Rustic Furniture Old Reclaimed Teak Wood. Home Furniture Teak Wood. More Teak Wood Furniture from Indonesia Rustic Furniture Made in Indonesia . Java Teak Furniture. Teak Wood Benches, Teak Wood Daybeds, Tables etc. Teak Root Furniture Made in Indonesia Log Furniture from Indonesia Rustic Furniture Made of Teak Tree Root Wood from Teak Plantations in Java Indonesia Home and garden furniture made of teak root wood. A very unique one of a kind furniture from Indonesia To place an order for our furniture, please send e-mail to us using inquiry form. When sending us an inquiry, please remember to include your complete address, phone number and a brief info regarding your company or your business. We receive many e-mail everyday, please be serious. We give response only to serious inquiry. Thank you for your cooperation. We're looking forward for doing long term business with you. For immediate response, call (62 81) 7973 1022 after emailing. Garden furniture made of teak wood. We have a large collection of outdoor furniture and patio furniture made of teak wood. The teak wood taken from teak tree root. The hardest part of the teak tree. Our teak garden furniture surely will last for long time. Very little maintenance is needed. 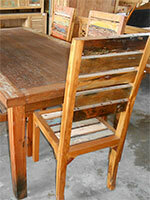 Recycle Wood Bench from Bali. Teak Wood Doors and Gateways Indonesia. Acrylic and Wood Furniture Bali. Teak root furniture. 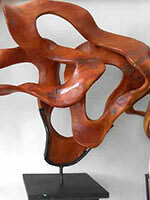 Remember also to visit our photo gallery of teak root furniture from Java Indonesia. Beautiful teak root furniture such as bench, chairs and tables. All made of teak tree root wood from teak plantations in Java Indonesia. Good quality cheap price. Teak root bench indonesia. Browse our catalog of teak root wood bench. These catalog shows you model of teak bench which available for ordering most of the time. Remember, we always ship garden teak root furniture in clean, fine sanded and finished condition. 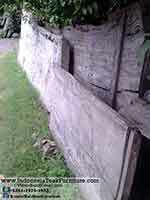 Sorry, photos here show many teak wood bench in half finished condition. Teak log furniture from Indonesia. Furniture such as teak wood drawers, teak wood tables and teak wood bookshelves. Teak dressers, cabinets, bar stools, coffee table, stool. Teak Wood Home Accessories Indonesia. Tree Root Wall Ornaments Indonesia. Teak Wood Dining Furniture Indonesia. Bench Daybeds Table Beds Furniture Indonesia. Click teak furniture links below to view the indonesia teak furniture catalog. Garden furniture made of teak wood taken from teak plantations in Java Indonesia. Furniture for outdoor garden, patio and lawn. Teak bench teak chairs, pool steamers tables and folding chairs. Teak furniture combined with the beauty of bamboo, it's teak bamboo furniture from Indonesia. Indonesia teak furniture exporter company for Indonesia teak wood outdoor garden, patio & lawn furniture manufactured in Central Java Indonesia. We supply furniture importers with garden outdoor teak wood benches furniture, teak wood garden chairs furniture, solid teak wood pool steamers & loungers furniture, teak wood folding chairs furniture, teak wood folding tables furniture, teak wood extension tables furniture, bali loungers furniture, teak wood patio sets furniture, teak wood lawn benches furniture, teak wood bar stools furniture for bar, cafe, restaurant & hotel, teak wood & bamboo combination furniture. Indonesia Teak Furniture web site is a teak wood garden out door furniture from Java Indonesia catalog of all of the teak wood furniture products we export. The site includes product catalogs of our teak outdoor & garden furniture products. The individual product catalogs include product code numbers, descriptions, dimensions and other detailed information about each piece of teak wood garden out-door furniture we export. You can use our teak wood garden out door web site to browse through our product line, make pricing and information inquiries and place an order for our solid teak wood garden furniture (teak wood garden bench furniture, teak wood garden chairs furniture, teak wood beach steamers furniture, teak wood garden tables furniture, teak wood extension tables furniture, teak wood folding tables furniture, teak wood folding chairs furniture, teak wood & bamboo combination furniture, teak wood bar stools). Big Wood Slabs Counter Tops Bali. Home accents from Indonesia Rustic home accents and decorations made in Indonesia We have many products for home and garden improvement, both furniture and home accents. Bali home wares and garden accents. 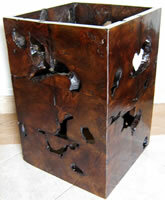 Made of various materials such as wood, stone, palm trunk, logs and twigs. These arts and crafts from Indonesia (Bali and Java) will be a good companion to our teak wood furniture. See teak wood bowls with copper inlay. Other than brass or copper, it is also possible to use aluminium for silver color. View our home accents products. These links will take you to our sister site www.Balifurnish.com. This site is the No.1 source in Indonesia for all handicrafts, accessories, arts crafts and home decors. To combine order for this site and order for Balifurnish.com is possible. We're under the same company, CV Maya. See also Indonesia furniture photos catalog on Flickr. Are you importer company searching for home and garden decorations made in Indonesia but not listed here? please let us know. We're able to source almost any kind of handmade arts products. Furniture, arts and crafts made in Indonesia from various islands. From Bali to Java, from wooden boats, Javanese house panel "gebyok" to dokar wheel. 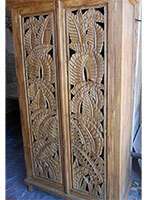 Arts and crafts made of any kind of materials such as teak wood, root log twigs, stone or wicker. Please send e-mail to us using inquiry form with product description and photos. We will locate the craftsmen, factory manufacturer or producer for you.